So many people wished to hear Bruce Maidment and Tom Berman talk to the Wargrave Local History Society on Hennerton and the Backwater that the meeting had to move from the Hannen Room into the Church. Tom began by explaining that the Hennerton Backwater is the largest and longest such on the River Thames. It had been thought that the house nearby took the name Hennerton from the backwater, but in Victorian times the latter was called ‘The Backwater’ - and it seems the name Hennerton Backwater dates from the early 1900s, and is derived from Hennerton Lane. Hennerton House, which was built by C F Johnson in 1817, had also taken its name from the Lane. Partly as a result of the Enclosure Award, Johnson and his successor, William Rhodes, owned land on both sides of the backwater. They therefore claimed The Backwater as their own, and hence called it The Hennerton Backwater. The land on and around the island was intensively farmed even in the mid 18th century, the record of tithes showing a staggering tonnage of eels being caught there. Since that time much flora and fauna has changed - water voles and eels are now rare, but pike survive, the heron are less shy, and Canada geese more common. There are less poplar and elm trees, but more ash, sycamore and alder, whilst the Loddon Lily continues to prosper on Wargrave Marsh. Bruce then told us about some of the lanes, paths and bridges in the area. One of the earliest names in this part of the parish is ‘Ford’ - mentioned in 1539, who lived at Ford House. It seems likely that the Hennerton Backwater had a lower water level at that time, with a ford leading to the island and a chain ferry to Lower Lashbrook, which lasted until the 1940s. Further south was the Lashbrook or Shiplake Ferry - at the end of the footpath from Wargrave, and enabling villagers to reach Shiplake Station before Wargrave got its own in 1900. At the north end of the backwater, Johnson’s Bridge was probably built - near the site of the ford - in the 18th century - although there may have been earlier bridges there too. The bridge at the south end (under Willow Lane) was initially built for Fidler’s Farm, to reach grazing on Wargrave Marsh, and so is called Fidler’s Bridge - also probably built in the 18th century. Willow Lane is still a private road. 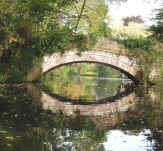 Conway’s Bridge was built in 1786, and it is probable that the Henley Road was moved further up the hill in connection with that. The modern understanding is that whilst the river banks and bed belong to the riparian owners, the water flowing along the backwater is a public right of way. Tom then described many of the houses in the Hennerton area - such as Lake Cottage - about 300 years old, and a popular tea house from the 19th century until 1934; Cowleys - originally a Tudor farmhouse, then the Bell and Bottle Inn, then 4 cottages, and now a house again; White Cliff and Lavender Cottages - the last lavender grower being Zachary Allnutt, parts of whose threshing machines remain in the woods; and Park Place, and the various buildings in the extensive grounds, including Conways Bridge, the ‘Druids Temple’ and the Frank Lloyd Wright house. Bruce then brought the story up to date, by considering the way the backwater was maintained - the banks cleared and channel dredged. Traditionally this had been done by the Thames Conservancy - most recently in 1980, but under the National Rivers Authority and Environment Agency the anticipated regular clearances had failed to happen. Several willow trees had fallen into the backwater, and these blockages led to silting up of the channel. The Agency response at the time was poor, and so The Hennerton Backwater Association was formed - to identify the various riparian landowners, monitor the water levels, open a collective dialogue with the Agency, and get the trees etc cleared away. The first Association working party set about this task in October 1999, and by the next summer the channel was once again navigable to any craft able to get under the bridges. 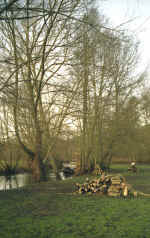 The floods of winter 2002 (the worst since 1947) helped to scour out the channel. 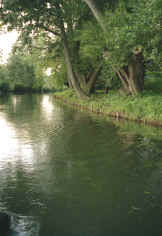 Eventually, the Agency and Association have agreed to an experimental planting to stabilise parts of the bank, and this was put into effect in June 2003. 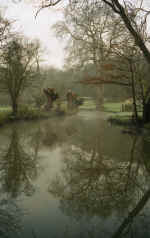 For a collection of information about The Backwater, you might like to look here.